A straight line is the shortest distance between two points. 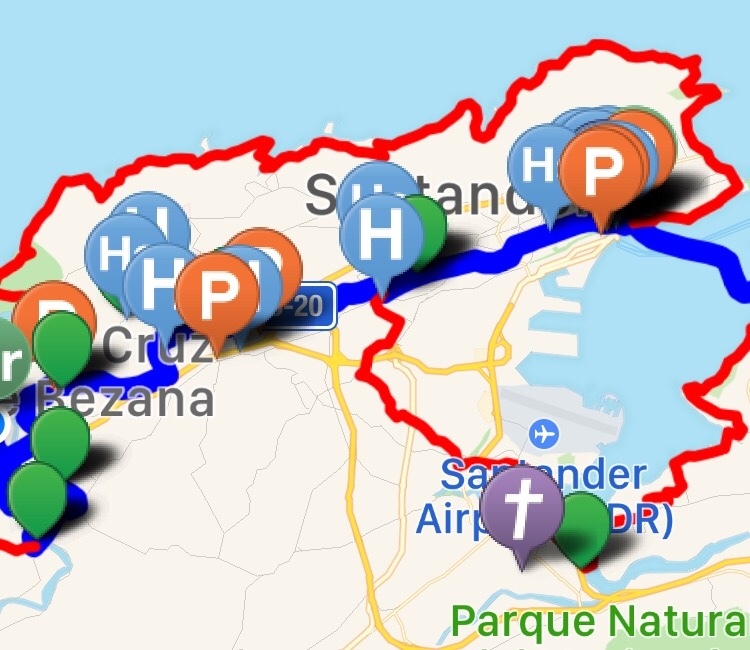 There is a fairly straight line between Santander, where we started the day and Mogro where we ended. We took the other, as just as fair. It offered the potential for beautiful scenery. In that regard it did not disappoint, but it may have not been the wisest choice of the day. In the accompanying screen shot from an app that we are following, the blue line represents the “official” route and the red lines represent options which are sometimes shorter. Sometimes. Enticed by the lure of more spectacular views we left Santander along the coast, by the local golf club and past the light house. Sonia was battered by the previous week and moving slowly. I enjoyed the opportunity to take in the view. Then it became clear that we were going to be on this meandering costal path for a very long time. We found water and were bolstered. Then we saw the hill ahead and couldn’t quite figure out how to get there. The sign said no passage and the fence line reinforced the message. We went the other way, and found our selves near a small village. We made the decision to switch inland to the smoother and presumably shorter surface roads. Google refused to give us a route. As we came to the first major road that we choose (against the advice of Google) we decided to stop for lunch. We had planned a picnic lunch along the coast. We had hundreds of incredible places to stop. We sat down on bench in a nondescript park near the road. And I saw a bus stop. We had been moving for nearly five hours straight and were not entirely sure where to go. I went to the bus stop, found a map, talked (tried) to the woman waiting there. In 30 minutes or so a bus would move us along over a few miles where Google said we should not walk to where we needed to be. Google was right. In 15 minutes the bus put us back on the Camino where we walked another mile or so to the train that would take us over the river (an actual two minute ride) to Mogro. 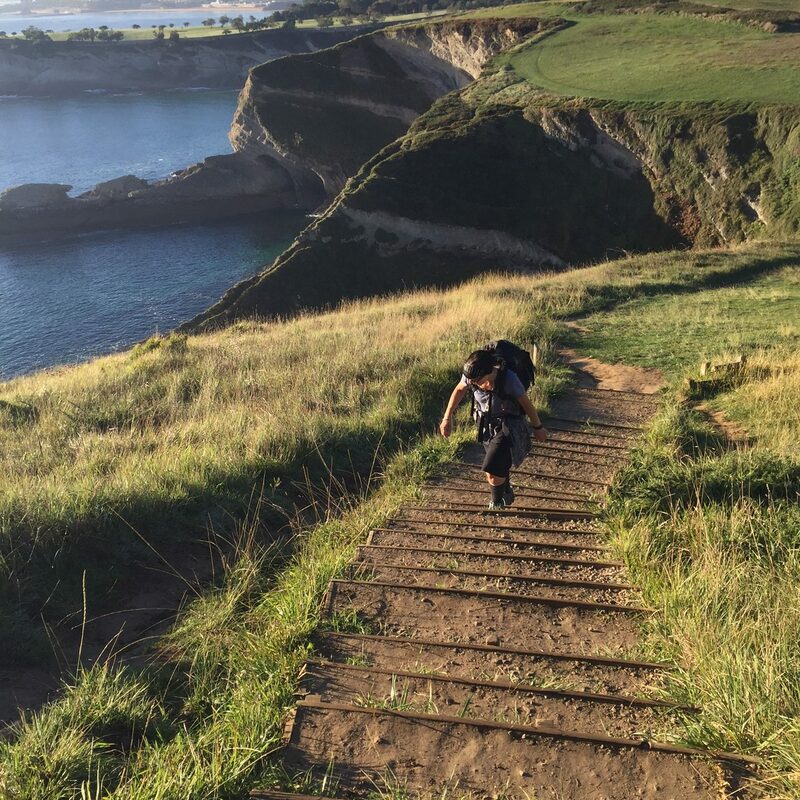 God put us on the path we needed when exhaustion had set in. God sent a boat, and we were wise enough (this time) to get in. The whole day became a lesson in straying from the path. Enticed by beauty we wandered. It was fun for while, but it was not where we should be. 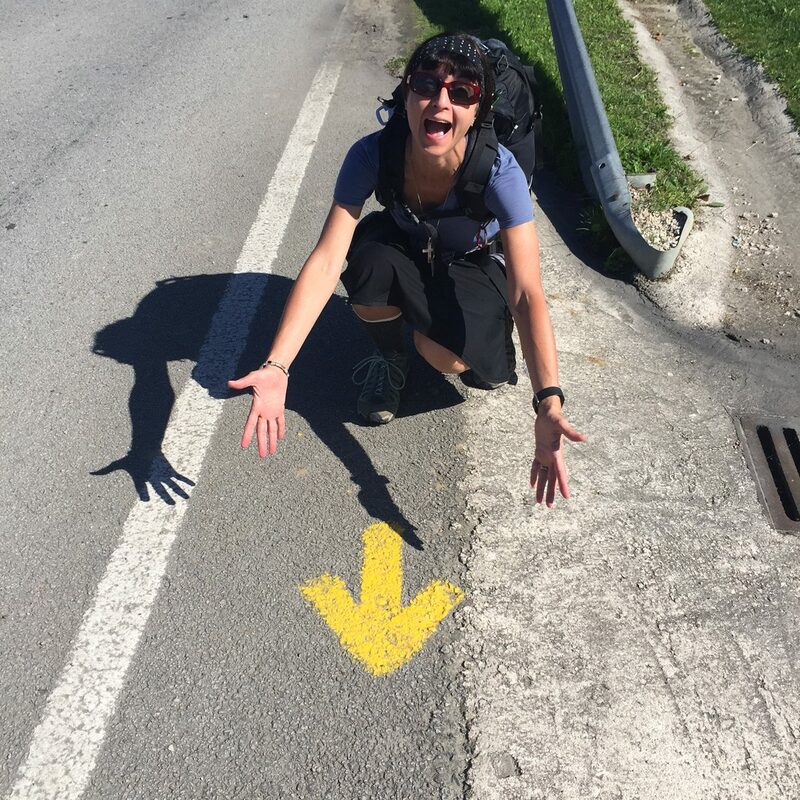 We both felt a great sense of relief when we found the yellow arrows of the Camino again and had some assurance that we were on the right path. I wonder how many other times I have been led away from the “right” path? God always seems to offer ways to entice a safe return.